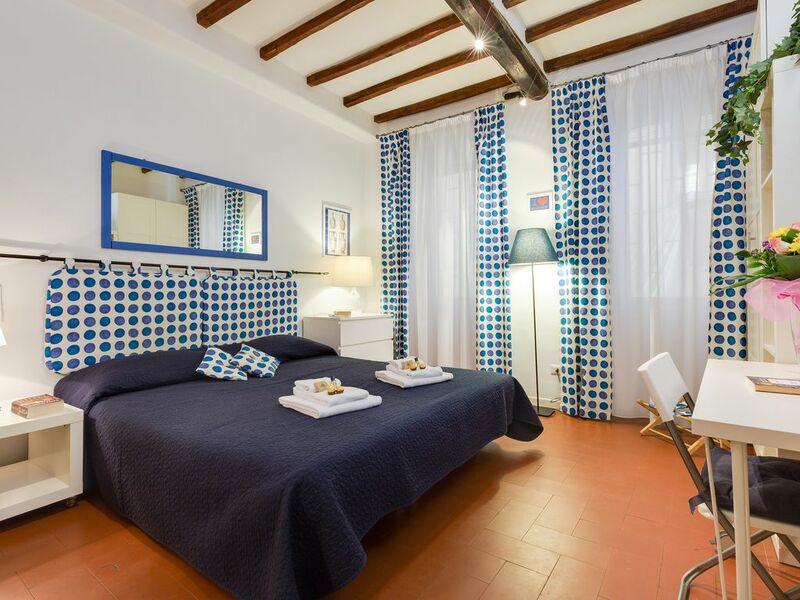 Piazza dei Satiri Studio is a cozy apartment located near Campo de Fiori, in the center of Rome. Suitable for up to 2 people, the apartment has a double bed in the main room, a well-equipped kitchenette and a bathroom with a shower. In the structure there are also a Wi-Fi Internet connection, a TV, A / C system and heating. Its central position will allow you to reach in a few steps Campo de’ Fiori and Piazza Navona, as well as the Pantheon, the Jewish Ghetto and the characteristic Trastevere area. With a few minutes of pleasant walk, you can also reach Piazza Venezia and the Colosseum, the Trevi Fountain and Piazza di Spagna, which with its staircase will take you on the beautiful Pincio terrace, from where you can enjoy a breathtaking view of the city. Apartment is located in a very central area. Very walkable to all the main tourist attractions in Rome. Very functional. Only thing I would say is the water shower pressure is really slow. If this could be rectified, it'll be perfect especially on a cold winter day! Dear Li, Thank you so much for staying with us. Thank you for having chosen this accommodation and for your review about it. I am very pleased you enjoyed this apartment for your stay in Rome. Just back from a lovely weekend in Rome, it was our 1st time and we loved it, the apartment was clean and fresh and very centrally located, easy 20-25 minute walk to all main attractions (Spanish Steps, Vatican, Coliseum) just across the road was Piazza Navona which was lovely to sit with a wine and take in the atmosphere (10 euro a wine though), Pantheon and Trevi was just a close walk nearby and are also breath taking, the main bus stop and tram are less than a 5 minute walk away also and we used the public transport and trams and got to see a lot more of the city, thank you very much for a lovely weekend!! Dear Guest, I'm delighted you took the time to share your review. It’s wonderful to know your stay was pleasant. I’m glad you enjoyed the great location. Thank you for staying in my apartment and I look forward to seeing you again. The surrounding area offers numerous shops, bars and restaurants and the central location of the apartment allows you to easily visit the city either on foot or using public transport.